Irteza Ishraq explores the nature and science of star formation. Some 1,300 light years away in the Orion Nebula, a newborn protostar feasts on a parent dust cloud – and for the first time, an international group of researchers from Taiwan and the USA have captured in unparalleled detail a snapshot into this earliest phase of star formation. Using the Atacama Large Millimeter/Submillimeter Array (ALMA) telescope in Chile, the most expensive radio telescope ever built, a team of researchers led by Chin-Fei Lee of the Academia Sinica Institute of Astronomy and Astrophysics (ASIAA) have captured the image shown above. The image shows a circumstellar (pancake or ring shaped) accretion disc around a protostar from a side-on view, becoming the first to do so in such detail. The predicted location of the protostar is denoted by a white asterisk. Current widely accepted models of star formation start with the formation of clusters of dust within larger dust clouds. These clusters undergo gravitational collapse once the force of gravity becomes larger than the pressure supporting their structure, compressing the cluster of dust further to a protostar. Protostars are the earliest stage of life for most stars, and they generate their luminosity through gas falling into them rather than by thermonuclear fusion. Theory suggests that the dust cloud surrounding the protostar ought to form a circumstellar accretion disc that feeds into the protostar, a prediction that has now been clearly imaged. The protostar in question, lovingly named IRAS 06413-0104, lies in the HH 212 protostellar system and is calculated to be just 40,000 years old – practically an infant in the astronomical scale, with our own Sun being about 4.6 billion years old. 1(a) shows images composed from from both the ALMA and the Very Large Telescope displaying the HH 212 system and jets of gaseous particles streaming from the circumstellar disc. 1(b) zooms into the circumstellar accretion disc showing the so-called “hamburger” shape of the structure, with dark layers surrounding the equator of the disc. The final image, 1(c), shows a 3D model of the same accretion disc further emphasizing its structure. Credit: ALMA (ESO/NAOJ/NRAO)/Lee et al. Images of circumstellar accretion discs have previously been imaged from a view looking down at the face of the disc. However, through being able to image the system from a side-view in such detail, the new image further confirms the structure and formation of accretion discs around very young protostars, as well as imposing constraints on current theories of disc formation. “It is so amazing to see such a detailed structure of a very young accretion disc. 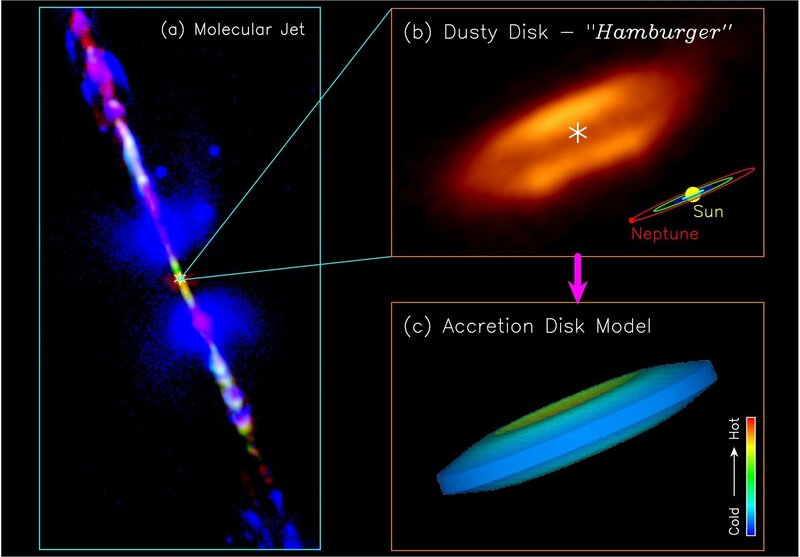 For many years, astronomers have been searching for accretion discs in the earliest phase of star formation, in order to determine their structure, how they are formed, and how the accretion process takes place. Now using the ALMA with its full power of resolution, we not only detect an accretion disc but also resolve it,” said Chin-Fei Lee, in an ALMA press release. In-falling from the accretion disc stops once the protostar begins thermonuclear fusion. This produces strong stellar winds that releases the surrounding gas, leaving them to cool and form a protoplanetary disc, from which planets eventually form. Detailing the mechanics of the earliest forms of star formation allows for researchers to critique and evolve their models of star formation, consequently helping determine how planetary systems like our own solar system formed.